This dossier provides figures and statistics on U.S. exports to China, with a focus on federal states that have taken the lead in exporting various goods to China. The United States and China are the world’s largest economies with a close and long-lasting trade relationship. As of 2013, China was the third largest export market for the United States after Canada and Mexico. Commodity exports from the United States to China have grown substantially over the last decade, except in 2009 due to the global financial crisis. California, Washington, and Texas were among the leading U.S. states exporting to China in 2013. That year, Californiaexported approximately 16 billion U.S. dollars worth of goods to China, a gain of 15.7 percent on 2012. Computers and electronic products, waste and scrap, and transportation equipment are California’s top exports to China. California also belongs to the United States’ top import states from China. The theory of comparative advantage suggests that under the condition of international trade, countries could profit from the specialization in the production of goods that they are relatively efficient in producing. 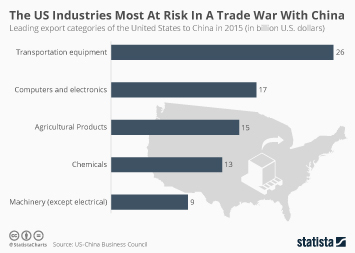 The United States’ comparative advantage over China lies in high-tech manufacturing and agricultural products, as is reflected by the leading export categories to China. California, home to numerous technology enterprises, exports electronics such as semiconductors to China to be inserted into mobile phones. Exports from Washington to China are dominated by the aerospace sector, as it is home to major assembly sites of Boeing. By comparison, China’s comparative advantage lies largely in labor-intensive, manufactured goods.